In this photo you can see how wrinkled this particular linen comes out of the wash. I am always drawn to the tattered. I want to thank Brenda of Cozy Little House for featuring me on her Welcome Wagon post on Friday. I am happy to have some new followers. Michele, your photos are beautiful. Those tulips with the frayed edges are gorgeous and your linens are wonderful. I am so happy to be following you and have now followed you on linky as well. So pretty, love the linen on your bed it looks so cozy! 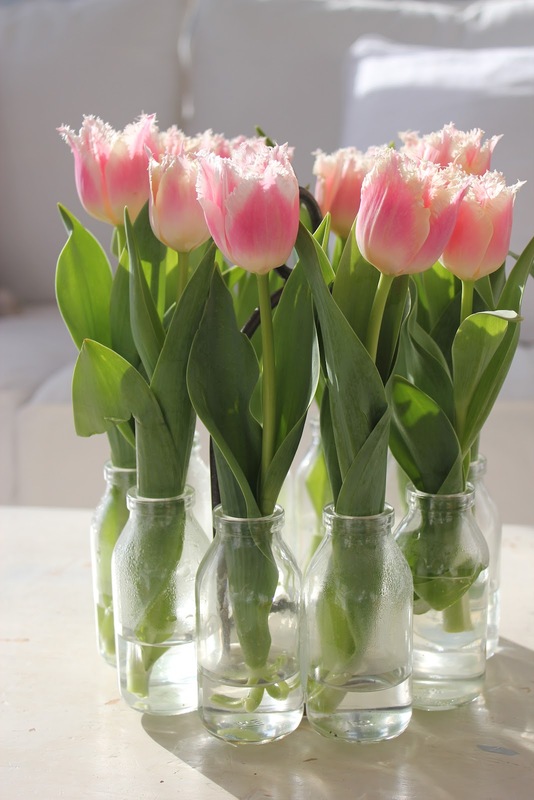 Those are about the prettiest tulips I've ever seen! I assume they're real. They are gorgeous. I like tattered things too. I think that's why I don't mind my sofa being messy sometimes because it just gives the whole room a lived in comfortable look. Well at least that's what I tell myself. Ha! Brenda introduced my blog too. Isn't she helpful doing that? Glad you got more followers. Love your blog! I liked your blog when I found it and put it on my blog roll so others can find you too. I love the tulips~so pretty. I think the coverlet is just wonderful with the tattered edges~I have a pinterest category called Tattered. I agree~its nice. The linens are WONDERFUL! and your photos are too! Gorgeous Tulips! Wow, Michele, I love the linens and the inspiration behind them! Stunning, truly. I have this style tullip growing in our front garden. I love them and the frilly edges. I wondered about your frayed edges on the fabric. I've made a few pillows for my room and my sons room and like that frayed edging. Do you put something on it so it doesn't continue to fray? I don't do anything to the edges. The majority of the fraying will happen after the first wash. So, when I am making something with these edges, I wash the fabric first, to account for shrinkage. Then I make the sham, coverlet, and wash again. I trim afterwards. From then on it seems to be only a few strings after each washing. I notify my customers that they will have to do this. But this is the only fabric I leave the edges unfinished with. I suppose that other fabrics may be different. Thanks for the question. Oh Michele, what an awesome post...the linens as well as those amazing tulips. I have never seen those kind before. I have been blessed with a lot of yard and garden space....the previous ownerss were the original owners...........and they planted all sorts of tulips. When they come up they bring the most amazing color and beauty to the new earth coming alive in early spring...........and then, tulips being deer "crack" as it were..........they don't make it through the night the day they come up and if I don't go cut them immediately the deer take the tops off of EVERY. SINGLE. ONE. I have missed it the last two blooming seasons, wish me luck this year! Love, Love your post!! The tulips are amazing and I love the linens! Your work is beautiful! I love the pillow shams on your bed! Lovely post! I posted it on my Facebook wall! Congratulations! Gasp! LOVE IT! I visited a high-end store here in Oklahoma City not long ago and they sold Bella Norte Linens. The dust ruffle/bed skirt they were selling was $425.00 for a queen....no decking just the skirt. It looked just like your tattered fabric! YUmmmmmmMEEEEE! You are incredibly talented. Thank you so much for sharing on WW!